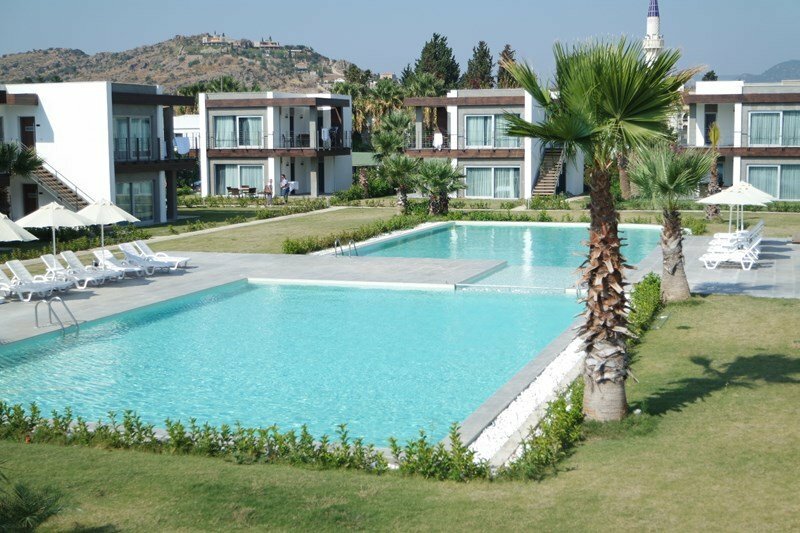 Luxury VIP fully furnished 2 bedroom ground floor seaside apartment located in Ortakent at one of the best locations on the whole Bodrum peninsula in Turkey. A very special complex with private sandy beach, Olympic sized swimming pool, children's paddling pool, restaurants, cafe bar and 24 hour security. A 5 star perfect place for you and for your family to have a wonderful holiday. Free WIFI. ●Living room : Sofas, chairs, coffee table, dining table and chairs, satellite TV, air conditioning. ●Kitchen : Oven/hob, fridge with freezer, iron, kettle, toaster, crockery, cutlery, glasses etc. ●Bedrooms : Fully furnished 1 double, 1 single, house linens, towels. ●Bathrooms : 1 fully fitted bathrooms (shower rooms), hair dryer. Note : Baby cot and high chair provided if needed. Ortakent is a town of two halves – the inland business district and the beach area. They are a couple of km apart, which is typical of many of the towns you will see on the Bodrum Peninsula. If you drive through the central part of the peninsula, the main road will take you through Ortakent, because it's the converging point for the roads between Bodrum, Turgutreis and Yalikavak. It's situated about 13km from Bodrum, and you'll pass the weekly pazar set up at the roadside each Wednesday. Although the major peninsula roads pass through the town of Ortakent, most vacationers will probably give this district barely a glance, as they navigate through the town, past the tangerine orchards and head straight to the long strip of Ortakent-Yahsi beach, which is about 3km from the business district. When you come down the hill into Bodrum, the first sight to greet you is the impressive medieval castle built by the Knights of Rhodes. It guards the entrance to Bodrum's dazzling blue bay, in which the Aegean and the Mediterranean Seas meet. The town's charm is well-known, attracting a diverse population of vacationers who stroll along its long palm-lined waterfront, while elegant yachts crowd the marina. Not far from town, you can swim in absolutely clear, tideless, warm seas. Underwater divers, especially, will want to explore the numerous reefs, caves and majestic rock formations. The waters offer up multicolored sponges of all shapes and sizes, octopi and an immense variety of other aquatic life. The reputation of Bodrum's boatyards dates back to ancient times, and even today, craftsmen are still building the traditional yachts: the Tirhandil with a pointed bow and stern, and the Gullets with a broad beam and rounded stern. The latter, especially, are used on excursions and pleasure trips, and in the annual October Cup Race. Bodrum has gained the reputation as the center of the Turkish art community with its lively, friendly and Bohemian atmosphere and many small galleries. This community has encouraged an informal day-time life style and a night-time of excitement. The evenings in Bodrum are for sitting idly in one of the many restaurants, dining on fresh seafood and other Aegean specialties. Afterwards night clubs (some with cabaret) and superb discos keep you going until dawn. Bodrum, known in the ancient times as Halikarnas which was the capital of Caria, was the birthplace of Herodotus and the site of King Mausolou's Tomb (4th century B.C. ), one of the Seven Wonders of the Ancient World. In the harbor, the Bodrum Castle, or the medieval castle of St. Peter, is a fine example of 15th century crusader architecture, and has been converted into the Museum of Underwater Archeology, with remains dating as far back as the Bronze Age. The stunning panoramic view from Goktepe, nearby, is much photographed by visitors to the Museum's 2nd century theater. The beautiful Bodrum Peninsula suits holidaymakers interested in a subdued and relaxing atmosphere. Enchanting villages, with guest-houses and small hotels on quiet bays, dot the peninsula. On the southern coast, Bardakci, Gümbet, Bitez, Ortakent, Karaincir, Bagla and Akyarlar have fine, sandy beaches. Campers and wind-surfers enjoy Gümbet, and at Bitez colorful sail boards weave skillfully among the masts of yachts in the bay. On shore you can enjoy quiet walks through the orange and tangerine groves bordering the beach. Ortakent has one of the longest stretches of sandy beach in the area and offers an ideal place for relaxing in solitude. One of the most beautiful beaches on the Bodrum peninsula, Karaincir, is ideal for lively active days by the sea and relaxed, leisurely evenings with local villagers. Finally, Akyarlar enjoys a well-deserved reputation for the fine, powdery sand of its beach, it's also considered as one of the best beaches in the world. Turgutreis, Gumusluk and Yalikavak, all with excellent beaches, lie on the western side of the peninsula and are ideal for swimming, sunbathing and water sports. In Turgutreis, the birthplace of a great Turkish Ottoman admiral of the same name, you will find a monument honoring him. In the ancient port of Myndos, Gümüslük, you can easily make many friends with the hospitable and out-going local population. In Yalikavak white-washed houses with cascading bougainvillea line narrow streets. Small cafes and the occasional windmill create a picturesque setting.